You know that old saying, “Every little bit helps.” Well, the opposite might also be true when it comes to home prices. A new study from the National Association of Home Builders (NAHB) revealed that a mere $1,000 increase in the cost of a new, median-priced home prevents more than 200,000 prospective buyers from even making an offer. 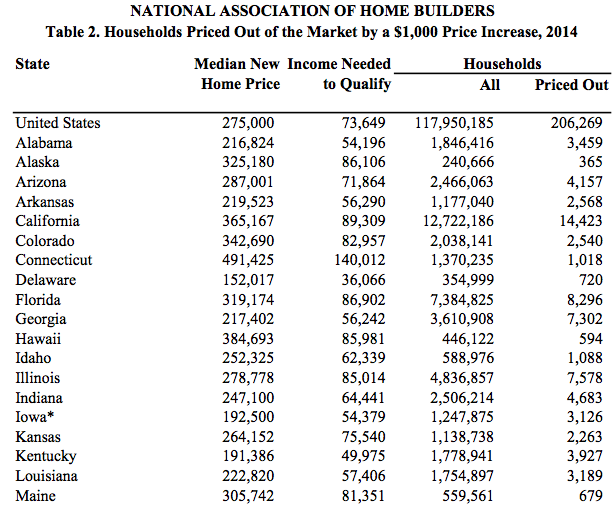 The NAHB makes several assumptions to come up with that number. For example, they use a median national new home price of $275,000. Additionally, the buyer is only expected to put down 10%. And the maximum front-end DTI can’t exceed 28%. Also, the mortgage rate used is 4.5% on a 30-year fixed mortgage. For the record, if any of these details change just a little, the math could be thrown completely out of whack. And guess what, mortgage rates do change all the time, and not everyone has to pay private mortgage insurance. It also depends on the type of loan in question, among other things. Still, of the nearly 118 million households in the United States, 206,269 wouldn’t be able to purchase a home that is $1,000 more expensive. Of course, the impact depends on where the home is located. In places where homes are already mostly unaffordable, tacking on another $1,000 to the sales price will do very little, if anything. But in places where prices are largely affordable, a seemingly small shift can force thousands to continue renting as opposed to buying. Overall, Texas would be the hardest hit state, with 18,250 households no longer able to qualify for a mortgage based on a $1,000 increase to a median-priced home. Of course, there are more than nine million households in the Lone Star State, so it’s not as bad as it sounds. Conversely, only 313 households (of over 225k) in Wyoming would be affected by a $1,000 home price increase, making it the least vulnerable state in the nation. In California, where the population is largest, only 14,423 households would be priced out because there are fewer affordable new homes to begin with. At the metro level, the New York-Northern New Jersey-Long Island area would be most affected by a $1,000 price increase, with 5,742 households effectively priced out. It’s followed by the Chicago-Joliet-Naperville, IL-IN-WI MSA, where 5,325 households would be priced out, despite having about half the number of households. Same story here – nearly a third of all local households can afford new homes in the Chi-Town metro, whereas only 19% of households in the New-York area can qualify for new home mortgages before any price hikes are even factored in. Similar pricing out can be seen in places like Atlanta, Baltimore, Houston, and Las Vegas. In Napa, California, where less than 15% of all households can afford a median-priced new home, only 18 households would be priced out. By the way, the purpose of the study seems to be driven by the NAHB’s distaste for regulatory fees, which they claim are passed onto the consumer. For example, every $833 increase in cost (permits, impact fees) results in a $1,000 increase in home price. And their research shows regulations imposed by the government account for 25% of the final price of a newly-built single-family home. In reality, there are all always plenty of options to qualify for a mortgage, even if the numbers are really tight. Shopping around to get your interest rate and closing costs lower can make much more of an impact than a $1,000 home price increase.